The tech world is still largely a man’s world: Women account for only 5 percent of startups and 25 percent of computing jobs. 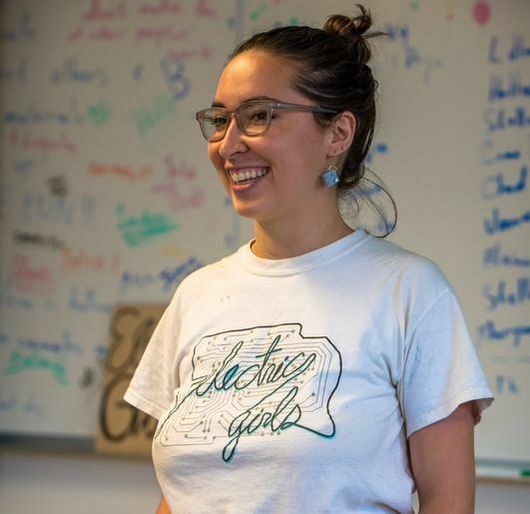 Loyola graduate Flor Serna is helping to close that gender gap with Electric Girls, an organization that helps girls 5 to 14 learn electronics and computer leadership skills. We recently sat down with Flor to talk about what she’s doing and why. What prompted you to start Electric Girls a couple of years ago? I started Electric Girls really out of my own experience, having worked in computer science but also as a recording engineer — you know, someone in the recording studio behind all the microphones and all of that. And in both of those areas, I was the only female. Were you the math nerd in class growing up? Interestingly, no. I actually hated math [and] did terribly in math until I hit junior year of high school. I got put in what they call, or what we called in high school, “the stupid math class,” where they’d put you based on your performance. And as soon as I got placed in that class, my math performance skyrocketed. I no longer felt intimated by the people who I thought were better than me at math. I felt like I was around equals, and I understood how calculus worked all of a sudden. That’s what actually accelerated my math learning to the point where I did study computer science in college. Tell us a little bit about Electric Girls and your programming. Electric Girls is a learning space where girls come together and learn different STEM skills with and from each other. Historically, we’ve taught computer programing that might be game design, animation, HTML. We also teach a lot of electronics, so circuitry, circuit building, learning how to use various power tools, robotics, all sorts of subjects that you typically wouldn’t imagine girls studying. What’s great about Electric Girls is the space that we create — really focusing on building a strong and supportive environment where women are teaching younger girls and girls are being mentored by each other to learn these skills and become confident in their abilities. Why are girls not learning these skills in the regular everyday classes? Part of the reason is that regular everyday classes don’t often have the capacity to teach what we teach. It doesn’t fit into the school day to teach students how to use a drill press or how to solder a circuit. But in general, I’d say there’s a lot of research behind why girls don’t necessarily click with STEM at a younger age, though they do express interest in it. A lot of that has to do with the way that programs are designed, so that intimidation really does hold girls back. When they are in an environment where they feel supported, where they feel relevance to what they are doing, they have an opportunity to succeed where they normally wouldn’t. Is part of it the fact that industry targets boys more in the the kind of video games they design or the kinds of toys they aim at children? It seems to be gender specific too often. Yeah, that’s been argued. I do believe that corporations could probably do a better job in terms of marketing. I’m not advocating for gender specific, girly focused computer games either, because I think that does some harm as well. I think the representation really matters, and for girls to not constantly see women represented in those fields will make them think, this is not for me. 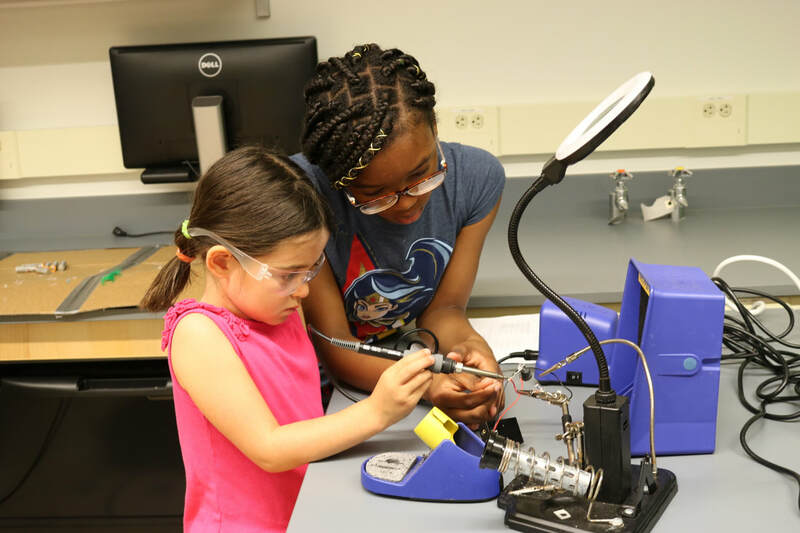 We have parents who have kids who have participated in our programs who have told me that their kid was totally opposed to participating in a STEM summer camp until they learned that it was all girls, and then she’s all for it. We’re in the 21st century; are girls still stigmatized for liking math or being able to pick up a wood press? I don’t think that they’re stigmatized for liking those things as much as, internally, they don’t understand that they could like those things. They don’t think that it is for them. Your camp instills not only skills, but also an understanding of the more technical world we live in now. 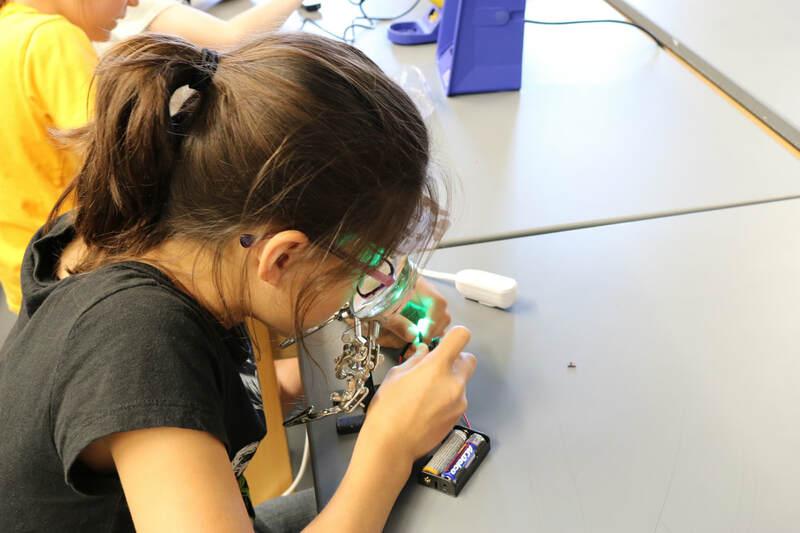 A big piece of Electric Girls that differentiates it from some other programs is that we teach girls some really fundamental skills and then we give them the space and the guidance and opportunities to use those skills to design and create their own self-directed projects. So, for example, we don’t tell the girls what to build, but we will teach them how to use a drill press, how to solder, how to apply certain amounts of voltage to certain types of circuits, and then we let them loose and guide them through a process where they can really design and build whatever they have within their own minds. They are much more motivated to build something that they’ve thought of, not something that a boring adult like myself has thought up. I don’t have close to as many ideas as they do, and I think it really helps them realize that they are capable of seeing through a project that they had in their own minds. What are a couple of projects that you’ve been particularly enamored with? Just last week we had two girls work together to build a fully functional soda-dispensing machine. It was amazing. They saw a video of someone doing it on YouTube, and they said you know what, we can do this ourselves. They built the whole wooden enclosure, which they then painted and made very cute, to dispense soda out of, and that was very impressive. You alluded before to a certain feeling of empowerment that women have when they work together, and women historically have been team oriented as well. Yeah, it’s true. We have integrated a mentorship component into our program so we work with girls anywhere from age 5 to 14. What’s interesting is that a girl who might be 7 years old might have done Electric Girls for 2 years, where a 13 year old might be there for the first time. So the mentorship does not really segregate by age. Girls are divided by age group for certain activities because that makes sense socially in the way we design our programs. We actually have badges within Electric Girls, so whoever has earned certain badges might be more qualified to help out someone else who hasn’t done the skill before. Electric Girls sounds a little like a rock band, which I think may be part of the point. There actually is a European band called the Electric Girls. I chose the name Electric Girls as a place holder. I called up all my friends, I said, “Can you please help me think of a great name?” and nobody could think of anything. So Electric Girls really stuck, and it just took off from there. Tell me a little bit about how you felt being the only female in a tech environment. To be totally honest, it didn’t bother me, which is interesting. I think more than anything I became fascinated by why that was the case. It really propelled me to get answers and that actually became my senior thesis at Loyola University. It was around why women do not pursue STEM academically or professionally after college. In adolescents, why girls are vocalizing why they don’t think they are as good at math as boys or why they vocalize that they are interested in STEM but don’t pursue it. That was really the motivation behind starting Electric Girls, researching all of those statistics and learning about program design that was built to solve those problems. I think we can celebrate gender differences. Perhaps women do bring a little more creativity or outside the box thinking because of who they are. Oh, definitely. There’s strong evidence for neurological differences between boys and girls, men and women, in the way that they think, in the way they solve problems, especially engineering problems. I think that we’re at a point in society where corporations know that in order to solve more creative problems they really have to make their spaces more diverse. What do you personally get out of Electric Girls when you walk into a classroom or into a camp and see girls working 3D printers or decoding programs on the computer? Mostly I’m just completely blown away by their inherent skills and abilities. It’s really not so much what you know, that Electric Girls is here to dump a bunch of knowledge into your brain; that’s not how it works. It’s really just about creating an environment where they feel 100 percent secure in exploring their skills, and it’s okay to fail, and it’s okay to mess up because you have two weeks to work on this project in Electric Girls, and you have 30 other girls and women around you who are going to help you build whatever it is you have that you want to build. So, I’m just constantly blown away by how amazing kids are. These are useful day to day living skills, not just careers. Oh, definitely. Schools actually approach us quite frequently, wanting our assistance in building students’ digital literacy skills. That means learning how to work with a computer, but also learning how to use a computer to build something of your own. Where is the digital age taking us? That’s a great question. I don’t know, but I will say this. I think that the importance of building mindsets and ways of thinking is going to be more important than knowing how to operate a 3D printer, for example. So it’s more about building perseverance skills, about building your planning skills, about building your ability to design or see a project through. Those things are going to stay with us no matter what. Where you do see Electric Girls headed? This fall we are launching our first big robotics program. We’ve traditionally focused a lot on electronics and different computer programing skills, and we want to give more offerings. We want to teach audio technology; we want to teach robotics; we want to teach more woodworking; just lots of different focuses. 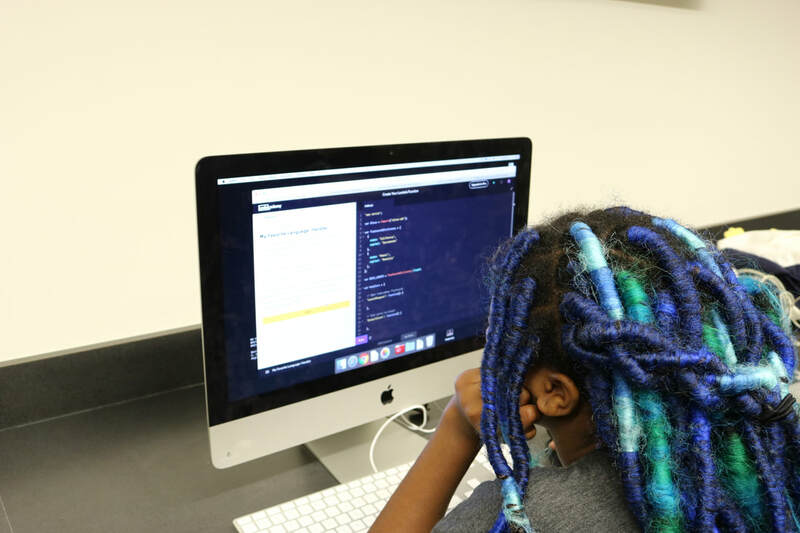 We also really want to focus on a high-school program, for the girls who have gone through our programs and are very interested in pursuing STEM at an academic or professional level — fostering them and focusing a lot more on mentorship [in order] to connect them to industries in New Orleans [that] might be interested in more than just “come visit our office,” but come and participate as an actual member of our team and learn something real in the field. We do after-school programs, weekend programs and pretty large summer camps. We also do workshops here around town, so there are lots of opportunities to get involved. Come and visit us if you want to see us in action. You can learn more about Electric Girls and their programs by visiting their website.